To my surprise, lies filled Mr. Kosaku Yokota’s statement (posted on his website on March 16th.) Although the content is amusing, we are sorry that he was forced to come up with stories so far from the truth. We should never have to do this. 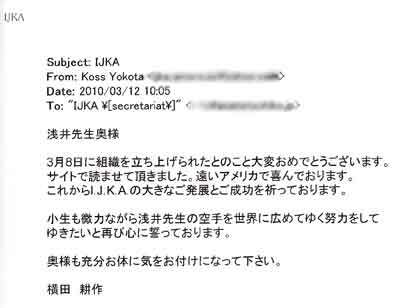 Before I make my rebuttal on each of his remarks, I would like to show the email we received from Mr. Yokota on March 12th, 2010* that clearly shows he was not involved in the re-establishment of IJKA. With such blatant lie, it should challenge the credibility of rest of his remarks, but if anyone is interested in knowing more about the truth, please read on. Congratulations on the establishment of the organization on March 8th. I read the article on the website and am sharing the joy from far away here in America. I offer best wishes for IJKA’s great growth and success. As for myself, however small my power may be, I have a renewed determination to spread Asai-sensei’s karate to the world. So, this email shows that he did not co-establish IJKA with Keiko Asai. In fact, he offered his help with English language later on and joined IJKA as staff upon his request. Again, it is puzzling that he would make such blatant lies about being the vice chairman, board member, and so forth, as we have records on the proceedings related to the establishment of the group, in addition to all of our correspondences from then. I will point out other “errors” from here, using direct quotes from his statement. I do not have a bad relation with the organization. It is hard to understand why he had to mention another organization’s name unnecessarily and say something unrelated and untrue. Master Asai established two organizations: JKS and IJKA. JKS had many qualified instructors and director s in their each region that left the management to them, and I took over IJKA, which did not have a successor. Master Asai used to say that he was lucky that he had so many excellent instructors and directors in each area. The reason why we did not base IJKA in Tokyo came out of respect to those sensei’s, and was nothing bad an indication of our bushido spirit. There was no bad reason for the decision. I am not sure why he wrote this. I have never expressed concerns or complained to him before. It is also simply inappropriate to mention personal matters like that. As I wrote in ‘The History of Succession and Re-establishment of IJKA.” I did not ask him for help, and with my experience, there was no need to ask help from him, who in truth was a businessman at the time and had no experience in establishing a karate organization. In the beginning of 2010, Mr. Yokota contacted me and requested that I send him 30 copies of blank dan certificates. I told him that the organization was still in the preparation stage and asked him why he needed them. To this, he replied that he would hold a dan examination and issue certificates on behalf of me to lighten my burden. I had to say no, but as I recognized there were karate students waiting to be tested and certified, I pushed forward the date to restart IJKA to March 8th, 2010. I told Mr. Yokota about the re-establishment of the group, and that he carry out tests in accordance with karate rules. The next time we heard back from him was the email message shown above, and he did not mention about the certificate or exams. Our motto is that we accept anyone who comes, and not stop anyone who leaves. I never resented that he left, and there was no reason for resentment. He said he was unhappy about the direction IJKA was taking, but the fact that he stopped contacting us after we refused to give him blank certificates makes it clear that he was unhappy because he could not get his way. It is strange to say that the direction IJKA was taking was “far different from what I envisioned when I started,” as the only time he was in contact was during IJKA’s inactive preparation stage, and we were not in contact at the time of the organization’s re-establishment. This is to say that, “what’s yours is mine,” and is rather a selfish reasoning. He should have remembered some manners as a martial artist to ask for permission if he wanted to use ASAI or Asai-ryu in the first place. That aside, if Mr. Yokota is to practice Asai-ryu karate and name his organization after Master Asai’s name, he cannot ignore the policies set out by Master Asai himself. It should not be difficult to understand. Every official organization has proper policies and members abide by the rules. IJKA is an official organization certified by the government of Japan, which was personally founded by Master Asai. If someone were to use the name of the organization, it is necessary to follow the rules and request for permission. What is not necessary is the harassing comment about obtaining permission from Mrs. Asai or the relatives. Keiko Asai is the successor and the president of the organization called IJKA. I am simply saying that it is nonsense to ignore Master Asai’s organization. Chen Sensei is and was the appropriate person, as written in ‘The History of Succession and Re-establishment of IJKA.” and these remarks are simply incorrect. Mr. Yokota being able to make such rude remarks on a Shuseki Shihan of an organization unfortunately only highlights the fact that he lacks courtesy. In the history of Budo, he is the first to insult and degrade other people’s master like this. It must be a result of total ignorance or arrogance, but a Budoka places prime importance on courtesy and the spirit of respecting others (“Respect others,” as we know, is in the karate dojo kun). I am not sure how he came to disregard all this. It is also incomprehensible that he is able to address the great master, the Soshi of shoto-ryu, Funakoshi sensei, as “Funakoshi,” and keep saying ASAI without honorific and named his group as that. Asai is a reputation Master Asai developed over his whole life. Please let me explain a little more. I say that it must be a result of total ignorance because one, he does not know Chen sensei, and two, he does not seem to be aware of the custom that still exists in the world of Bujyutsu. Because of this custom, Budoka do not easily insult other Budoka, because it shows Budoka value dignity. They do not insult others in the same, below, or above their own rank, let alone their own master, so insulting peoples’ master is unheard of. If he is not aware of this custom, he is not well informed to say the least. If he is not aware of this custom, he is not well informed. If he is in fact aware of the custom, his remark came out of his arrogance, as it would mean that he is confident that can win against any of the dishonored master’s students at any time. He had never said anything about establishing the organization in Japan and having the dojo in Tokyo. Even if he had, he had no right to oppose making the honbu in Taiwan. He mentions that the honbu dojo is in Taiwan and the members are mostly Taiwanese with very few Japanese. I would like to ask him why this should be thought of as a bad thing, and what relation does this have with Mr. Yokota? There are many karate organizations that do not have any Japanese members. If he thinks Taiwanese members are somehow less valuable then it is a serious problem. The whole paragraph is a lie. I am in fact genuinely impressed how much he can make up stories. After Mr. Yokota became a staff member looking after English documents, he only visited me on three occasions: December 7th and 8th in 2008 and April 23rd in 2009. Even then, our meetings were very brief and did not talk much as he was a busy businessman then, visiting Japan on his business trip. As he lives in the US, our only other communication was through fax and email. I have kept all of our correspondence, and anyone who still has doubts can look at the records, which make it very clear that he has made up the whole story. He did not give me any of the advice he said he did, and never had conversation about that. These are all vicious lies, and he did not need to bring in a third person into this mentioning him by name. I am also not in conflict with Mr. K. I tell the facts only when I am asked. Besides, he was the one who was the most upset about Mr. K in UK. Below is Master Asai’s hand-written policy on the Shihan title. The document is in Master Asai’s handwriting. He practices Asai-ryu karate and calls his group ASAI; what would be a logical reason not to follow the rules laid out by its own master? There is another very important reason for not allowing individuals to decide what they want to call themselves. Karate Shihan’s main objective is to advance people’s spirits, especially to train the youth so that they can become decent members of society. This is an important duty, and that is why the certification process for becoming Shihan is strict. One cannot just avoid taking a strict exam then make a group to carry out the certification exam and issue certificates. I was born Japanese and my very first education was Japanese education. I am also proud of the Japanese and Taiwanese for each of their individual excellence. I can proudly say that I am more Japanese than the Japanese who lost the Japanese soul. I have been training Chinese martial arts for a long time. I have also been involved in the world of Bujyutsu for 50 years with Master Asai. I can say that I have lived very close to bushido, and feel that he has no right to complain about me writing about bushido. He also mentioned that I was Chinese, which is unrelated to the topic, and if this was a racist comment, an alarming problem. Such remark is preposterous in the today's world when people wish for world peace. This simply shows that he only says he follows Master Asai’s policy about going beyond race and karate styles, when in actuality, he does not accept it. When Master Asai was still alive, there was person who forged and issued a few dozen dan certificates using the Asai organization’s official seal that he downloaded off the website. After Asai’s passing, there was someone else who issued fake certificates using both Master Asai and my name. Then, it was only a few months ago that we reported about a man in Germany who stole the IJKA logo off our website and applied for patent registration (see Topics). And now there is yet another person. This person is Japanese. For most Japanese, Bushido should be engrained by nature. To go against the spirit of bushido is unforgivable. Asai karate has never formed such organization. 2. 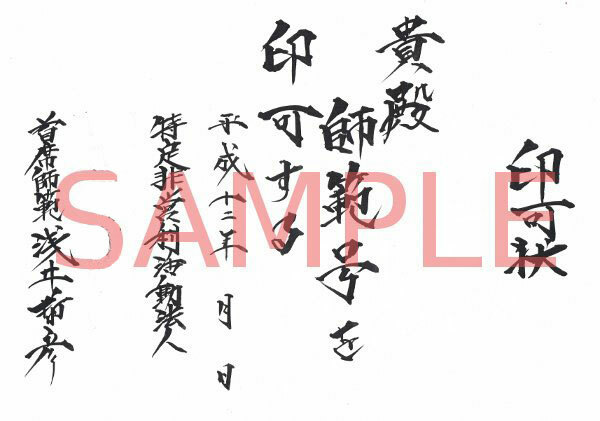 Acquired from our website the late Master Tetsuhiko Asai’s signature and using it. 3. Using the late Tetsuhiko Asai’s name whenever fitting. 4. Displayed a sample certificate dated June 18th 2013, certifying someone, even though the person is not qualified as the IJKA official certification examiner. 5. Calling himself as Shuseki Shihan, even though the IJKA would never give such a rank to someone who studied Asai karate for a mere two years. 6. 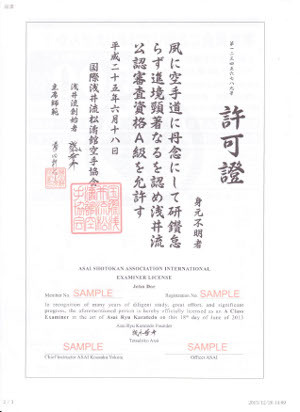 Committing a fraudulent practice by attaching “Asai’ to his own name on a certificate to clearly trick people outside Japan into believing that the certificate was issued by Master Asai. For those who are not from Japan, people are diverse and sometimes the Japanese bushido spirit is hard to understand. For that reason, Master Asai used to always teach them with patience. But to those who are from Japan, he was strict, saying that they should be familiar with the spirit of bushido. Therefore, I strongly condemn such actions. Every Bushi used to study and memorize the teachings of Confucius. One of them goes like this: A man of virtue does not fight with a little man. People who are doing good things sometimes tend to keep a distance from those who are not, as if to say they are not worth the time to get involved with. But if everyone acts like this and nobody tells those who are committing wrong deeds, they do not realize their crime and their misconduct may escalate. Karatedo is acknowledged as a wonderful martial art or sport in the world because it focuses on the spiritual development of people, especially youth. Some people forget about this. These people recruit many students and carry out shameful deeds to gain profit. Their innocent pupils are tricked and led in the wrong direction. We need to point them to the right direction before things get worse and taint the reputation of karatedo. This is why I condemn the aforementioned man. 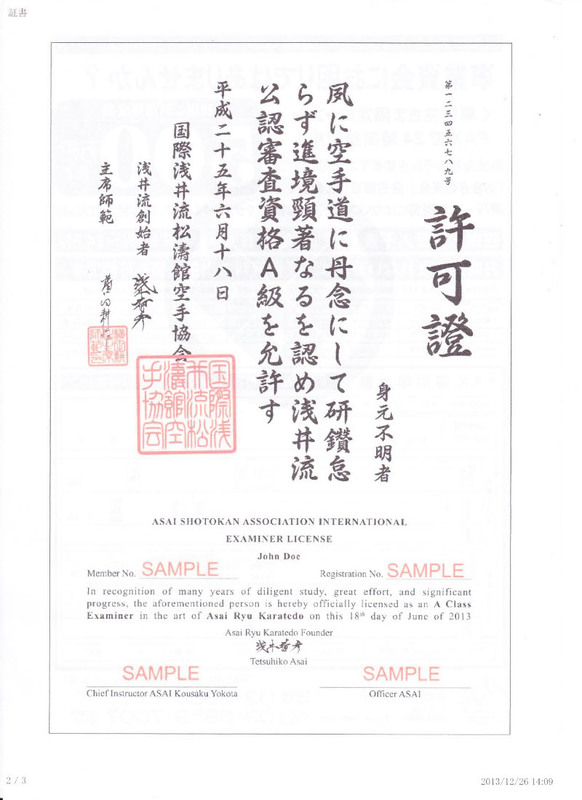 Below is a picture of a sample certificate dated June 18th 2013, which is qualifying someone of the official Asai-ryu examiner. We are sorry to announce that we had no choice but to terminate the membership of a certain member in Germany. We regret to inform you that your membership has been terminated effective immediately. You used Master Asai’s picture and IJKA logo without permission. You organized and held a tournament without contacting the headquarters without any official IJKA instructors present, while still using the IJKA name at the event. You organized and held dan examinations without contacting the headquarters and without any certified IJKA dan examiners present. You impersonated the role of an IJKA dan examiner without a certificate. You do not reply to any contact from headquarters. Because of this termination you must remove the IJKA name,logos and the Tetsubukai name from any and all of your materials effective immediately. Failure to do so will result in legal action. In addition to you breaching the IJKA rules listed above, you carried out a disrespectful act against karatedo spirits when you attempted to register the IJKA logo under your name. Trying to make the logo yours, one that Master Asai worked on for months and hand drew many times, allowed me see that you are not fit to follow the path of karatedo, and therefore I have terminated your membership. Before Master Asai’s passing, there was someone who downloaded Master Asai’s organization’s official seal and counterfeited many dan certificates, claiming himself as Master Asai. After his passing, there have been people trying to issue counterfeit certificates using Master Asai and my name. And now, yet another malicious incident has occurred. Some individual took the IJKA logo, which Master Asai drew himself over many months, from the IJKA website and registered it under his name with the Germany patent office. Karate has become suddenly worldly popular and gained many ardent students in a very short period of time. And so, to address the spirit of karatedo, we just put a poster up with the five Dojokun in dojos around the world. The greatest problem is that we failed to teach the spirit of karatedo to our students. This was one of the things the late Master Asai often lamented, and it continued until his passing. 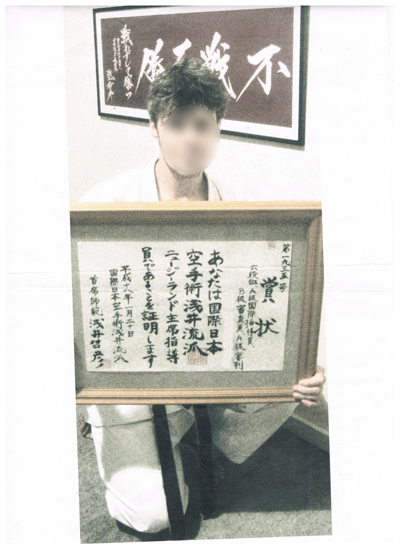 The certificate shown in the picture with Master Asai’s name is a fake. 1)	Master Asai did not establish a group called ''Karatejutu Asai-ryu'' and was never was a Shuseki Shihan for it. 2)	Master Asai did not issue certificate no.1935. 3)	Karate certificates normally do not show so much personal information of the recipient. 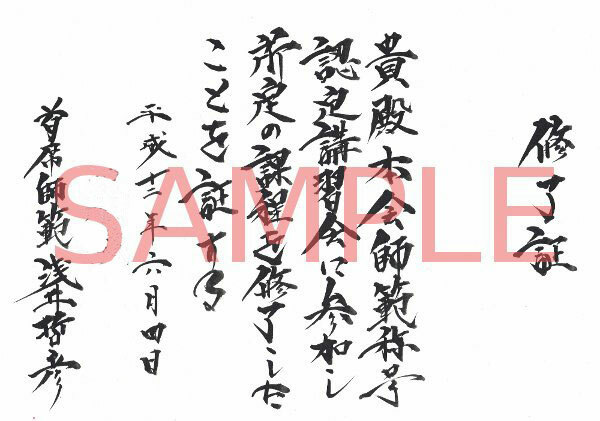 4)	The writing in the back (we do not know how he obtained it) is Master Asai’s writing, but the writing on the certificate clearly is NOT Master Asai’s - the difference is obvious. Master Asai’s students around the world know Master Asai’s writing. IJKA does not permit anyone from using Tetsuhiko Asai’s name without permission.